The National Park Service's National Register of Historic Places and Southeast Regional Office, in conjunction with the Atlanta History Center, the Historic Preservation Division of the Georgia Department of Natural Resources, and the National Conference of State Historic Preservation Officers (NCSHPO), proudly invite you to explore Atlanta, Georgia. Atlanta began as the terminal point of the Western and Atlantic Railroad, a project authorized by the State of Georgia in 1836. Originally known as Terminus, and later Marthasville, by the Civil War Atlanta was a bustling city. Crippled by the burning of the city during the war, Atlanta rebounded during the last part of the century. Today it is home to more than 4 million people and is considered the entertainment and cultural center of the South, attracting more than 17 million travelers each year. This latest National Register of Historic Places travel itinerary highlights 70 historic places that tell the story of this capital city--from its picturesque homes to its reaching skyscrapers--tales of former slaves, educators, authors, and millionaires who have shaped the development of Atlanta over the past two centuries. Union General William T. Sherman's occupation of Atlanta during the Civil War left much of the city in ruin, and antebellum era buildings such as the Tullie Smith House are today a rarity. 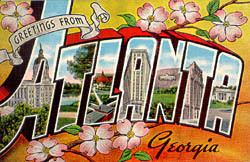 Yet Atlantans rebuilt quickly as the city became the junction of three of the region's most important railroad lines, and the location for the Georgia State Capitol in 1868. The end of the 19th century brought great industrial development, with factories such as E. Van Winkle's Gin and Machine Works, lining the railroad corridors radiating from downtown. 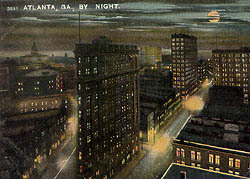 By the turn of the century, skyscrapers such as the English-American Building were dotting the city's skyline, and the dense redevelopment of downtown Atlanta had pushed residents to the edges of the city. Numerous suburban developments emerged such as West End, Inman Park, Druid Hills and Ansley Park. African Americans were establishing their own neighborhoods of Washington Park and Sweet Auburn, and institutions such as Atlanta University. Atlanta became the birthplace of the Coca-Cola empire--home to the company's founder, Asa Candler, who erected the Candler Building as a monument to himself, and the location of the early Dixie Coca-Cola Bottling Company Plant. Popular authors Margaret Mitchell (Gone With the Wind) and Joel Chandler Harris (Uncle Remus Tales) called Atlanta home, as well as major leaders in the black community such as Alonzo Herndon, a former slave who founded the Atlanta Life Insurance Company, and Civil Rights movement leader, Martin Luther King, Jr.
Atlanta, Georgia offers several ways to discover these places that reflect the history of this southern city. Each highlighted site features a brief description of the place's historic significance, color and, where available, historic photographs, and public accessibility information. At the bottom of each page the visitor will find a navigation bar containing links to four essays that explain more about Antebellum Atlanta, Industrial Atlanta, the African American Experience, and Growth and Preservation. These essays provide historic background, or "contexts," for many of the places included in the itinerary. In the Learn More section, the itineraries link to regional and local web sites that provide visitors with further information regarding cultural events, special activities, and lodging and dining possibilities. The itinerary can be viewed online, or printed out if you plan to visit Atlanta in person. Created through a partnership between the National Park Service's National Register of Historic Places and Southeast Regional Office, in cooperation with the Atlanta History Center, the Historic Preservation Division of the Georgia Department of Natural Resources and NCSHPO, Atlanta, Georgia is the latest example of a new and exciting cooperative project. As part of the Department of the Interior's strategy to promote public awareness of history and encourage tourists to visit historic places throughout the nation, the National Register of Historic Places is cooperating with communities, regions, and Heritage Areas throughout the United States to create online travel itineraries. Using places nominated by State, Federal and Tribal Historic Preservation Offices and listed in the National Register of Historic Places, the itineraries help potential visitors plan their next trip by highlighting the amazing diversity of this country's historic places and supplying accessibility information for each featured site. 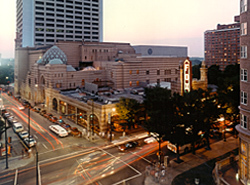 Atlanta, Georgia is the 25th National Register travel itinerary successfully created through such partnerships. Additional itineraries will debut online in the future. The National Register of Historic Places and Southeast Regional Office hope you enjoy this virtual travel itinerary of Atlanta's heritage. If you have any comments or questions, please just click on the provided e-mail address, "comments or questions" located at the bottom of each page.